It’s been eight years since the last drop of rain. Water is rationed like it is gold. People sponge bath rather than take showers or baths. The problem is particularly acute in the region around Albuquerque, New Mexico. Ruth (Gugu Mbatha-Raw, Belle, Beyond the Lights) is on the run. She seeks refuge in a motel. After settling into her room, she warns the manager to hide under a desk, and then ties herself to the bed. Suddenly what seems like an earthquake hits. The bed, room and motel shake like a volcano is erupting. Next day, in a diner, Ruth is befriended by a mysterious man, Bill (Christopher Denham, Argo). He buys her a cup of coffee and offers her a ride. What she doesn’t know is that he’s been tracking her and he plans to kidnap her. Why? The script (Julia Hart and Jordan Horowitz) gets just about everything right for the first 20 minutes. A mystery looms, tension builds and a protagonist in crisis is established. As she flees, you’re caught up in her predicament and experiencing her fear. As the footage progresses, the pacing slows to a snail’s pace, drama clogs the arteries, the staging and direction stagnate and the intensity the plight once attracted wanes. 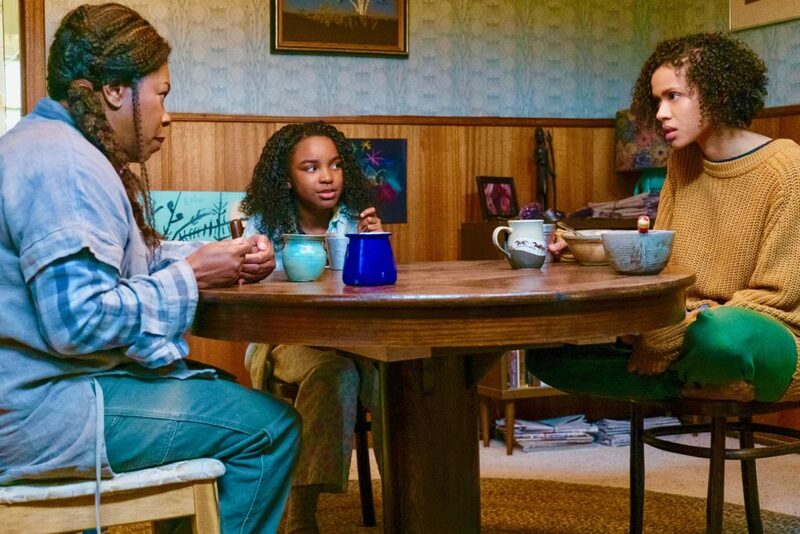 Fast Color crosses too many genres to be good in any specific one and that wreaks havoc on an audience’s attention. There are wondrous sci-fi elements: the skies produce a multitude of colors somewhat like the Northern Lights. Thriller aspects fluctuate: Sometimes Ruth is scared by the number of trackers who follow her, and sometimes not. The fantasy components have some magical qualities: A kid (Saniyya Sidney, Fences), Ruth’s daughter, can make bowls disintegrate. There’s a dull romance: Ruth’s mother Bo (Lorraine Toussaint, Orange is the New Black) has history with a local law-enforcement man (David Strathairn, Good Night, and Good Luck). Family drama emerges and drudges up the past: A super power ability has been part of Ruth’s family for generations. The problem with the ambitious genre blending is that it waters them all down. Just as you get used to an engaging frenetic rhythm, the speed grinds to a halt. You watch fascinating tricks, and then there’s a stretch of gloomy drama. Fear gets your heart racing, then the characters get bogged down talking about previous events. Credit cinematographer Michael Fimognari for some beautiful shots of a large white barn in the dead of night backdropped by a midnight blue and purple sky lit with twinkling stars. Then question why so many of the interior scenes look bland, as if they were shot with a 100-watt light bulb. The editing (Martin Pensa) doesn’t help the uneven pacing. Production design (Gae S. Buckley), music (Rob Simonsen) and costumes (Elizabeth Warn) neither help nor hinder. The visual effects with the bowls that break and mend are OK. Though, still, the events in the sky outshine everything else. Given the iffy script and questionable directing choices, the cast manages to keep their head above water. But, it’s like they’re performing without a net. Mbatha-Raw has been better in other films. Sidney is fine. Toussaint’s emoting seems overwrought considering the circumstance. In another movie, with different direction, her earnest performance would make more sense. Director/writer Julia Hart shows certain talent. However, she needed to decide which genre could help her turn a high-potential and engaging premise into a viable film. Making that decision would have helped her attract a genre-specific audience and an optimum number of movie fans. As filmmaker, it’s quite often hard to think about the endgame as you’re making a movie because you want to express your art. But if you don’t aim at a target you can’t hit it. Pick a genre. Learn the genre norms. Expand on them if you must. But don’t muddy the waters.